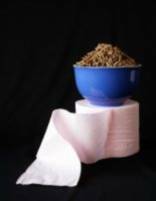 How important is bowel movement for hemorrhoids? It is not only important. It is the only key to avoiding hemorrhoids altogether, and the key to get rid of hemorrhoids, and the same key to cure hemorrhoids permanently, never to come back. If you get the right movement on the toilet. By that I mean a soft easy stool, which comes out effortlessly. You will definitely avoid hemorrhoids and all the complications that follow. The first part to a good movement is all the preparation needed. This is relatively easy to do. All you need is to just watch your daily food intake. I also like to add a gentle stool softener to my daily food intake to be 100% sure of a soft stool. Most people are actually constipated, but don't know it! If you have to push, even slightly to evacuate, then as far as I am concerned you are definitely constipated. It is probably just a mild constipation, compared to people that have to push until they are blue in the face, but it is still a constipation. It is this PUSHING that causes hemorrhoids, or will not allow hemorrhoids to heal properly. N.B. The harder you push, and or the longer you push, the more damage you do to your hemorrhoids. These problems of pushing often occur by using our modern toilets. Reading my E-book, you will have a detailed step by step guide to evacuating easily and effortlessly on a modern toilet without causing any damage to yourself, thus avoiding getting hemorrhoids. So to recap to the top question, do you think your toilet movement is important for hemorrhoids?